Show of hands: Who loves having a clean house? Now another show of hands: Who enjoys having to do the chores that'll keep your home clean? 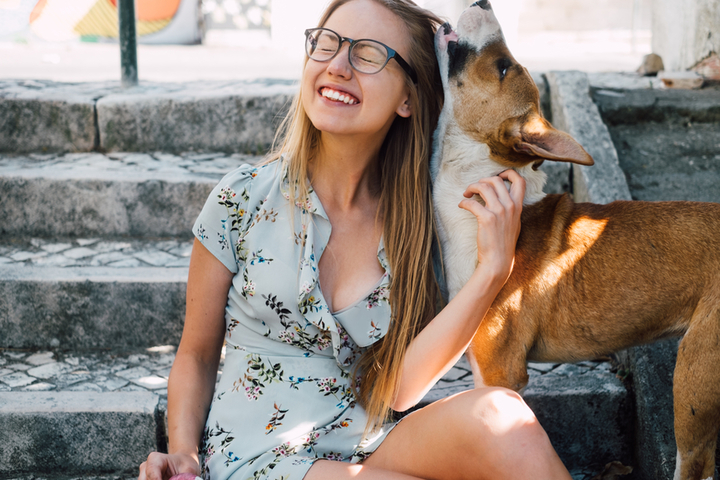 Even though we all love when our home is tidy, having to actually do the work to get there (read: household chores) is a whole different story. 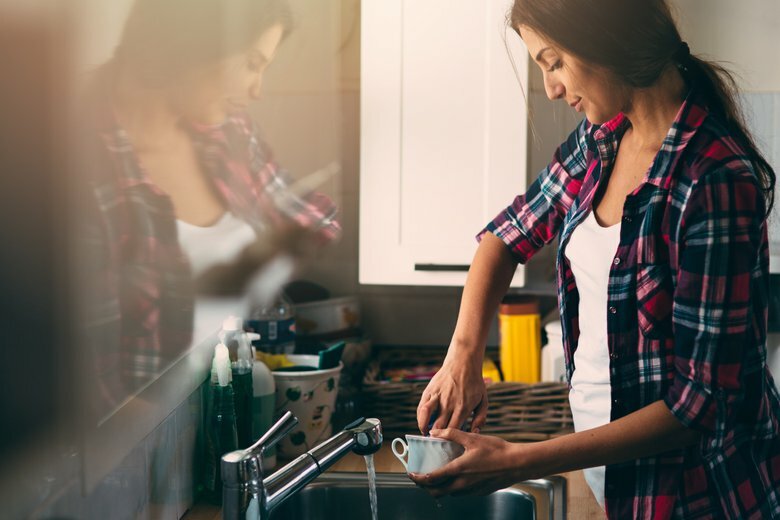 According to Collins Dictionary, household chores are typically considered to be "tasks such as cleaning, washing, and ironing that have to be done regularly at home," but, depending on your particular preferences and needs, that list could be significantly longer. That said, doing house chores doesn't need to be overwhelming! Once you break down the tasks into daily, weekly, monthly, and seasonal lists, you'll see how little time it actually takes to keep your house clean. Household chore lists can help you iron out (pun intended) what needs cleaning and how often. Daily household chores help you stay on top of clutter and make your home guest-ready at any time. The daily chore list should be shared among family members so no one has to do it all. Put things in their place. For example, toss clothes in hampers and have kids put their toys away. Clean up spills, dirt, and other messes (as needed). Wash your dishes after every meal. 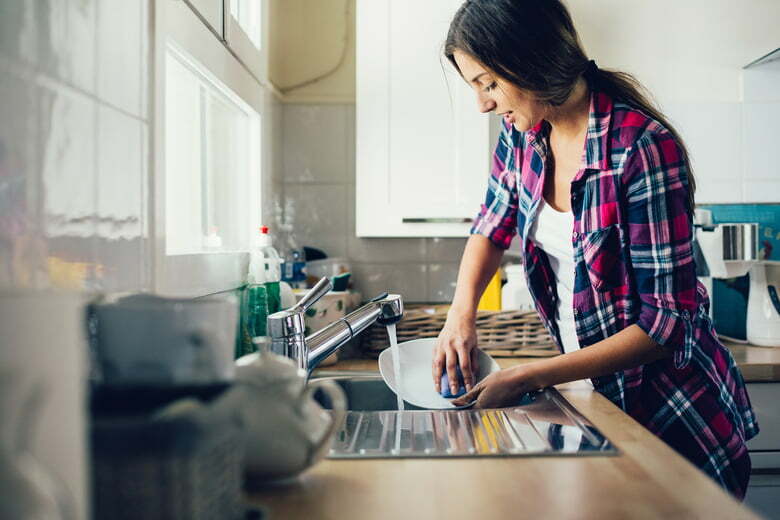 When dry or done, unload the dishwasher and put the dishes away. Clean all kitchen countertops. This includes your stove top. Put things away and wipe them down. Clean the outside of appliances. For example, wipe the outside of the microwave, dishwasher, coffee maker and refrigerator, etc. Put things in their place. For example, put all used ingredients, food and dishes away. Deal with your mail. Do this on a daily basis to keep clutter under control. Sort out the bills and important papers. Recycle the junk mail and outer envelopes and file the rest of the mail away. Vacuum high-traffic areas. You should focus specifically on any main entries. Put things in their place. For example, stack books, fold blankets, and have kids put their toys away. Take out the trash, compost and recycling (as needed). Do a quick wipe-down of bathroom surfaces. This includes sinks, counters, mirrors and faucets. One of the best ways to tackle weekly chores is to assign each chore a day of the week, as detailed in the blog She Makes a Home, which posts a free printable worksheet. For example, Sunday might work best as laundry day, so everyone has clean clothes for the coming week. If you know a particular day of the week is typically a busy one, assign a smaller chore for that day. Wash clothes and put them away. 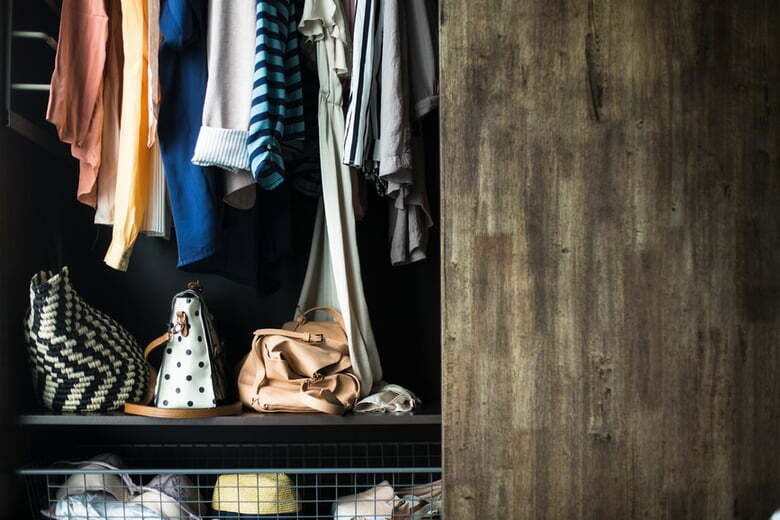 Lightly organize the inside of your drawers and your closet. Wash and replace bed sheets. This includes mattress covers and pillow cases. This can be done every week or every other week. Vacuum or sweep all floors. This includes all of the hard surfaces in your home. Mop all floors. This includes any hard floor surfaces in your house. 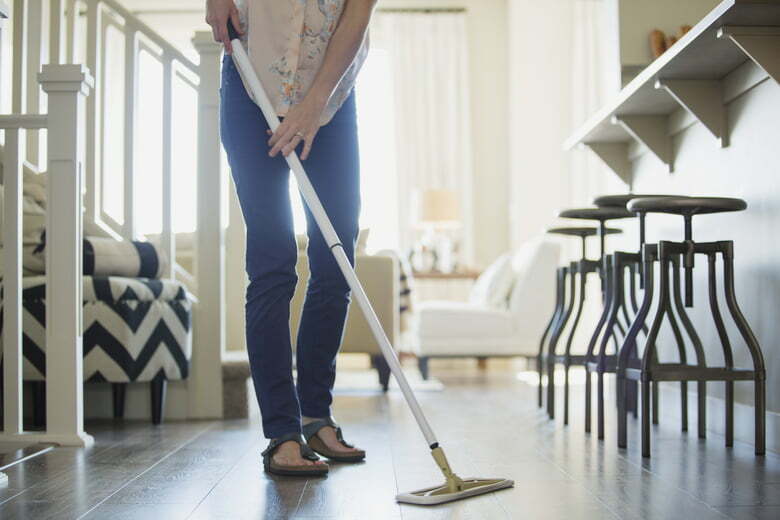 If you have hardwood floors, make sure to dust-mop them first. Show your refrigerator and freezer some love. Throw out unused leftovers, pitch anything spoiled and do a quick wipe of the inside and rinse of detachable parts. Wipe down the rest of the kitchen. Specifically, we mean wiping down kitchen cabinets and appliances, paying close attention to handles. Dust all surfaces. A quick dusting once a week helps reduce allergens and protects surfaces from scratches and wear. Give your bathroom a scrub. Thoroughly clean all surfaces in your bathroom(s), including the toilet, shower, and mirror. Replace and wash bathroom rugs and towels. Scrub sink and clean drain. Scrub the toilet seat and toilet bowl. Clean the tub and shower walls. Add these monthly tasks to your weekly chore list. But spread them out so you only add one a week to keep the extra work from becoming overwhelming. You can assign them to weeks -- for example, clean your furniture the first week of the month. Wash mattress covers the second week, and so forth. Thoroughly clean and organize the inside of your drawers and closet. Reorganize and fold clothes. Vacuum and sweep. This time, clean under your furniture — especially your bed — and in any hard to reach places. Clean the inside of your oven. Clean the inside of your trash cans and recycle bins. Clean out your dishwasher. Just make sure you're using a cleaner that's recommended by the dishwasher manufacturer. Clean your furniture. Vacuum cloth furniture, such as sofas. Wipe down wood furniture with cleaners. Treat leather furniture with a conditioner. Wash your bedding. This includes comforters and duvets. Wash ceiling light fixtures and wipe fan blades. Wipe down light switches, door handles and the surrounding wall area. Clean the inside of your washer and dryer machines. Don't forget your windows. Make sure to dust, vacuum, or wash window coverings. Wipe down baseboards, moldings, doors and door frames. Scrub the tub and shower walls and floor. Sweep and mop the bathroom floor. Spring is historically a time to clean all the winter dust and soot from a home. Though the purpose now is different, your house and your sanity still depend on a good seasonal cleaning and decluttering. 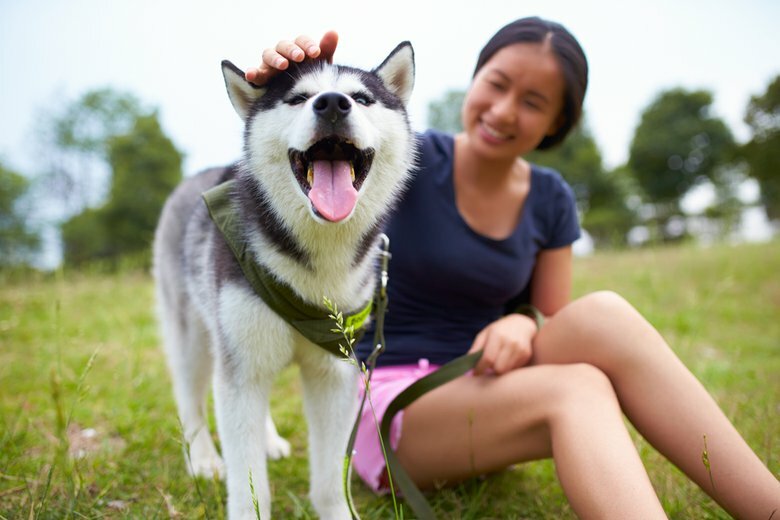 Seasonal tasks typically can be done twice a year, in the spring and fall. Clean out your closet. Attend to your closets and dressers by donating items you no longer wear. Store winter and summer clothes in bins or in the back of the closest when out of season. Wash pillows and some stuffed toys. Clean out toy bins. Organize your kids’ toys and school items by donating things you don’t need or use anymore. Deep clean the fridge, freezer and pantry. Throw out expired items and scrub everything. 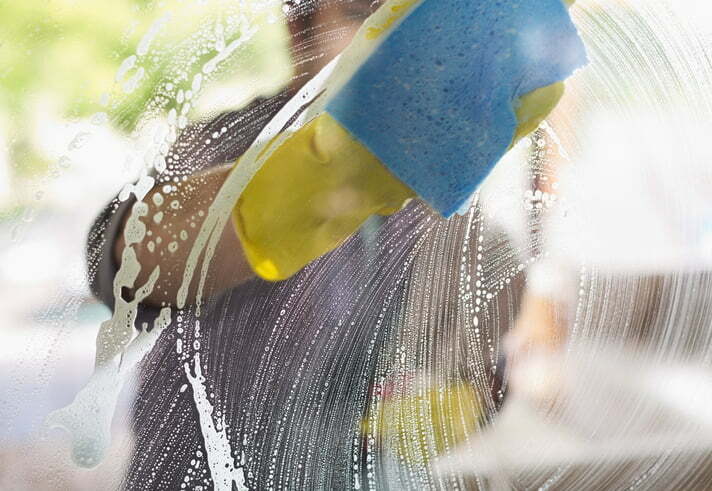 Wash windows inside and out. Cleaner bottles that attach to your garden hose make this job easy -- and fun for kids! Run a carpet cleaner and clean your rugs. Clean the floor under the rugs, as well. Clean under furniture. Move lighter pieces and use an attachment to vacuum under heavier items. Vacuum and clean out air vents and their covers. Clean wood furniture. Better Homes and Gardens offers some instructions about what products to use. Apply tile and grout cleaner. 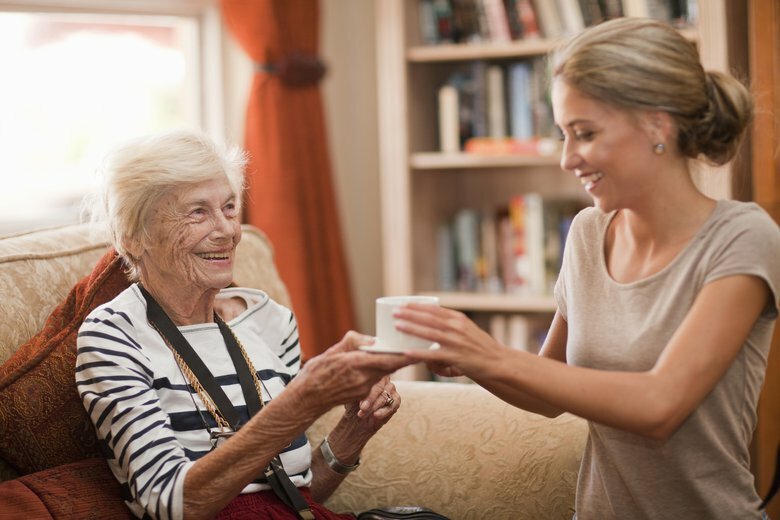 It may help to make family members their own lists so everyone knows what is expected of them. Just remember to keep kids' chores age appropriate. Need some ideas? 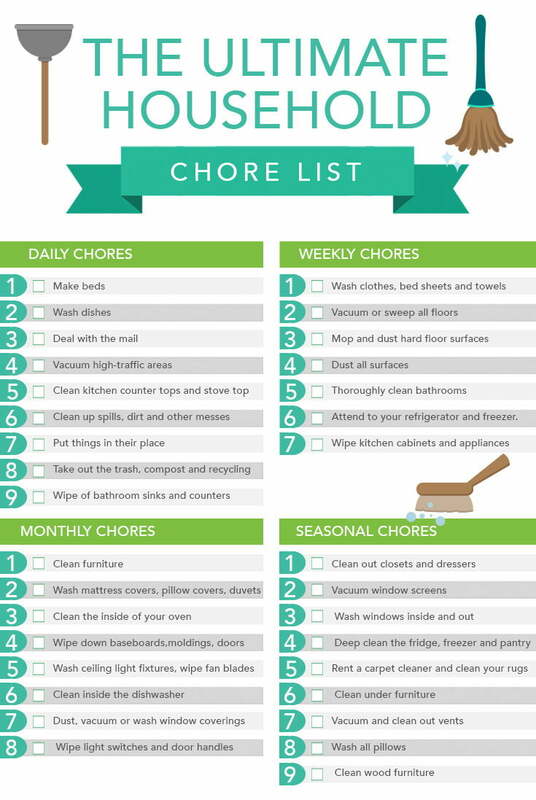 Check out A Chore Chart for Kids to get you started. Originally written by Kit Arbuckle. Updated by Andrea Lirio on March 6, 2018. I just made a printable image by using the "Snipping Tool" program that has come with operating systems since Windows 7. It is very easy to use, simply click the arrow to the right of "Mode" to choose "Rectangular Snip," then draw your box, save the image, and print! Instead of zooming out with your browser, try changing your "screen orientation" to portrait instead of "Landscape" in your computer's "Settings" and then "Display" options, use Alt+Tab to switch back to your browser, and THEN use the snipping tool once you've gotten everything the optimal size and how you'd like it. It may sound complex, but it is VERY easy, and will change your life with what it allows you to do - its only limitation is your imagination!!! I repeat the question is this list available to print anywhere? or a template in excel or word that can be used. Thank you in advance. is this list available to print anywhere?